Makin' it in Memphis: Project Kitchen: Put a cork in it? 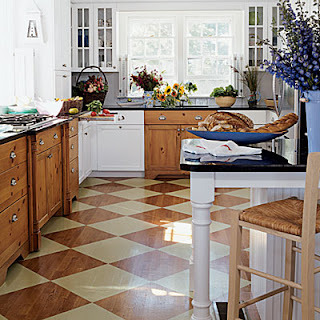 As you may recall from this post about my dream kitchen, I have an intense love for painted wood floors in kitchens. They're all the rave right now and we looked at a house with them and I fell in love. The only problem is that we don't currently have wood floors in our kitchen. I can't fathom actually buying nice wood floors then painting them. It would be one thing if I had nasty ones (like I bet the ones in that house we looked at probably were) and I was trying to hide the fact. But new wood floors? Definitely not going to paint them. The other issue is that wood floors are comparably expensive and with our peasant sized renovation budget, probably not going to happen. While not as shiny as my painted hardwood, it is the same idea. And it is more resilient for all the messes we'll have in our kitchen. And easier on the budget. And "green" too, I hear. I love it! This is definitely being filed away in my "idea" folder on my desktop for the renovation. 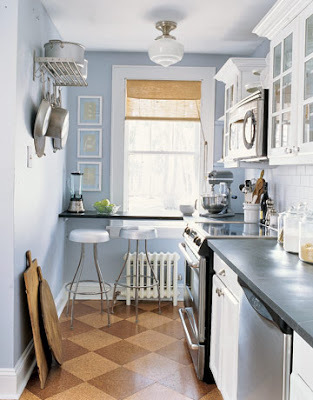 Another thing that is funny about the picture above (which by the way is from Country Living) is that I was just telling my mom that above the counter with my gas range (so on the wall next to the stainless range hood) I wanted a stainless pot rack. And look what is on that wall - I mean really. Available at IKEA, I hear. Good thing I know some people planning to move to Atlanta for a job in a little bit... I sense a road trip coming on. My office is about 8 minutes from Ikea, and we're trying to buy a house that's 10 minutes from work. So, no matter what, you can stay with us within a comfortable driving radius of Ikea. :-). As an aside...I love the cork floor! (And Country Living is my new favorite magazine...kind of a guilty pleasure that I sneak in between reading for class).